Bentley’s EXP 10 Speed 6 personifies the future direction of luxury and performance using the finest materials and advanced hybrid technology. EXP 10 Speed 6 is a British interpretation of a high performance two-seater sportscar. From the racing success of the company’s early years to the international motorsport success of today, ‘speed’ is part of Bentley’s DNA. This inspiration is expressed throughout the EXP 10 Speed 6, where iconic Bentley design cues are fused with progressive craftsmanship techniques and modern technologies. Copper elements are used as accents to both exterior and interior features to highlight the performance hybrid potential of the concept’s advanced new powertrain. Performance goals including top speed are set to challenge competitors and define a new segment benchmark. The exterior design of EXP 10 Speed 6 is an expression of muscular, athletic surfaces inspired by the aerodynamic shapes of aircraft fuselages and wings. The ethos of the design was to develop contemporary interpretations of Bentley styling cues, which have been brought together with beauty and precision. The result is a coupe of clean, modern surfaces whilst remaining unmistakably Bentley. 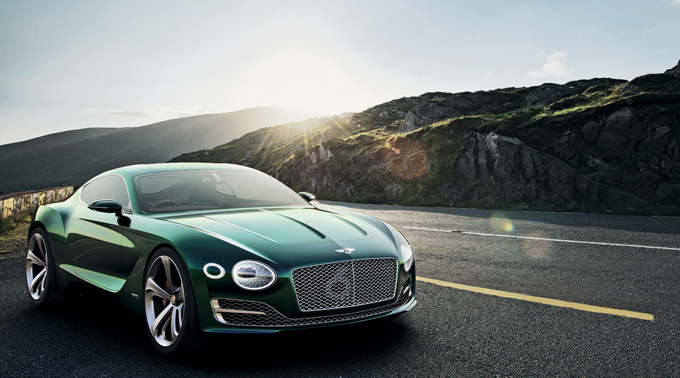 Creating exciting contemporary ideas from classic starting points is evident across the car, from the new interpretation of the iconic Bentley matrix grille and four-round headlamps to the paint colour – a deeper, richer and heavily metallic version of British Racing Green. The principles of established Bentley luxury have been applied in new and invigorating ways that use the latest technologies and techniques. The shapes and lines of EXP 10 Speed 6 represent a dynamic sculpture, creating harmony between sharp lines and flowing surfaces and using twisted surfaces to imply speed. Combined with muscular proportions and an athletic stance through the use of a short front overhang, long bonnet, low grille and wide rear shape with a long C-post, the exterior styling hints at high speed potential of the car. Every exterior material and each individual detail is designed to modern Bentley style. Cutting-edge 3D metal printing technology has allowed the grille mesh, exhausts, door handles and side vents to be delivered with micro-scale design detail precision. The iconic Bentley mesh grille, for example, is no longer a flat plane of latticework but includes varying depth with a complex 3D geometry only visible when viewed at an angle. Bentley’s renowned quilted leather has inspired three dimensional texture to the precision glass of the headlamps. These exterior elements come together to present a Bentley for the next generation – lean, toned and exquisitely precise, designed around new evolutions of the design elements that unite all Bentleys – past, present and future. The inspiration for the interior comes from the continuous line that runs around the cabin, driving through the console and into two symmetrical wings before flowing into the door and looping back into the console armrest. Two elegant quilted sports seats are positioned either side of the narrow centre console which houses exquisite driver controls and a highly intuitive 12” touch screen. These features combine futuristic technology seamlessly with progressive Bentley craftsmanship. Each detail has taken core Bentley interior DNA principles and moved them forwards. For example, the classic and purposeful Bentley knurled surface is a feature throughout the controls of the car, but now created using steel and copper together to create a two-metal 3D texture. Continuing the fusion of traditional materials and contemporary design statements, the doors of EXP 10 Speed 6 feature 3D quilting, milled directly in to solid straight-grain cherry wood. Each resulting diamond is finished with a copper centre. The centre console integrates digital information with tactile controls via a curved touch screen housed in an aluminium frame. The fascia instruments deploy from a flat position into the drivers view as the car is started using the floating “B” button integrated in to a non-symmetrical gear lever finished in aluminium, copper and cherry wood. A mechanical rev counter and digital display combine to provide the perfect balance of modern driver information and analogue beauty. The rear interior space is divided into two compartments designed to house a specifically designed four-piece luggage set. Like the rest of the interior, the rear has been trimmed by the master craftsmen at Bentley in the highest quality Poltrona Frau leather. There are currently no comments on BENTLEY’S BIG UNVEIL. Perhaps you would like to add one of your own?